For the full flavor of Jamaican rum and sweet raisins, look no further than this perfect collaboration of tastes in this Rum Raisin flavored coffee. Made with 100% authentic Arabica beans, this Rum Raisin flavored coffee will coat your taste buds with its decadent cinnamon undertones and vanilla, butter-infused raisins. 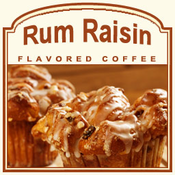 Creamy with a smoky and sensual aroma, the Rum Raisin flavored coffee has only 2 calories in each delicious cup � making it the perfect daily indulgence for those that love rum-infused coffees and of course, fresh raisins. Roasted and shipped on the same day, the Rum Raisin flavored coffee features a dark roast that will make you crave for more. Packaged in a heat-sealed valve bag, this Rum Raisin coffee has a truly distinct fusion of flavors that swirl around the vanilla sweetness, cinnamon rum, and fruity raisin sapors.